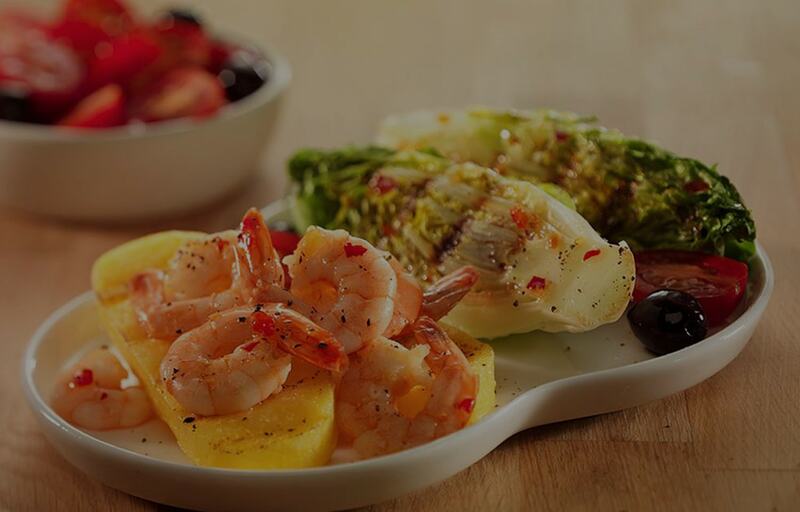 Add a little pep to prawns with this sweet and spicy recipe for your George Foreman grill. Perfect as a light snack or a starter, chilli prawns are easy to prepare and cook and you won’t be able to stop with just one. Pre-heat your George Foreman Grill until ready. Slice the polenta into 8 slices and brush lightly with olive oil and place on the grill for 5 mins. Place the prawns in a bowl with 1 desert spoonful each of sweet chilli sauce and olive oil. Turn in the mix carefully and leave to marinate. Cut the little gems in two lengthwise, brush with a little of the prawn marinade and place on the grill. Turn the polenta to cook on the reverse side. Thread the prawns onto short wooden skewers and place on the grill. Cut the tomatoes in half and place in a bowl with the olives. Remove the grilled lettuce when golden brown on the cut side. Once the prawns are sticky and golden remove from the skewers and add to the salad . Place the grilled polenta on a plate and top with the salad. Make a quick dressing from the chilli sauce and olive oil to taste and drizzle over. Add salt and pepper as needed.